French Canadian Chantal Jauvin is an international barrister. She met Dr. Amporn on a trip to Thailand, and on learning of his improbable journey she felt compelled to capture the life of a man who had the courage to survive and thrive against tremendous odds, and to define for himself what belonging really means. 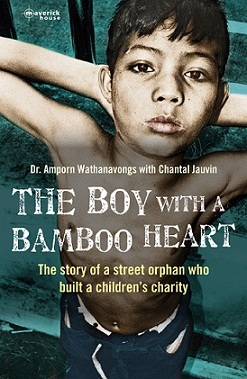 Why the title: The Boy with a Bamboo Heart? The title emerged after the writing of the book. As a rainstorm swept through Hua Hin, where I live part of the year with my husband, I was captivated by the bamboo swaying in the midst of the storm. Once the downpour passed, the bamboo stood upright again to provide shade for the locals. What better way to describe Dr. Amporn than by reference to bamboo? The bamboo is known for its resilience, versatility and strength. Those are some of Dr. Amporn’s greatest personal qualities. He survived years as a street orphan and as a boy soldier. He adapted to life as a monk and then reinvented himself as a husband and a father. His will to find his way and help others has been a strong determinant throughout his journey. But there are more subtle similarities between his character and the bamboo tree. The trunk of the bamboo is composed of hollow parts and rings. This internal structure is what makes the bamboo strong. Each part of Dr. Amporn’s life is like one of these compartments. Together they form his life and make him strong. The foundation he has created, FORDEC, is a testament to his benevolent heart. Like the bamboo, he nourishes people and produces oxygen in the form of hope and dignity. When I think of Dr. Amporn, I think of a bamboo heart. As an international barrister, you must come across many challenging yet inspiring stories. What particularly drew you to Dr Amporn’s? I have always been drawn to ordinary people who become heroes. Dr. Amporn’s story is nothing short of a hero’s journey. What I loved about this story is that this is a Thai man helping Thai people. We often read of foreigners being inspired to help people far away from their homes. Those acts of altruism are no less genuine and noteworthy. However, to help the people in your own neighbourhood means that you take responsibility. Thailand is a very diverse country with a rich culture too often packaged for tourist consumption. The opportunity to broaden the perspective beyond stories of experiences in the Bangkok Hilton prison, and the prostitution or “companionship” industry, was a motivating factor. There are many unsung heroes in this country whose stories need to be told to show the hearts and souls behind the smiles of Thailand. Do you speak Thai? How easy, or difficult, was it for you and Dr. Amporn work together? I have never learned Thai. My mother tongue is French, but I learned English in my last year of high school. Dr. Amporn also speaks English. We communicated in this, our shared second language. We did have some miscommunications. For example, Dr. Amporn rarely uses the personal pronoun “I.” Instead, he uses “we.” This led to some humorous moments during our interviews. For example, when he told me “Then we kissed her for the first time…” referring to his first embrace with Sunee, the woman who became his wife, it was hard not to laugh. Over time, I learned to know when he was referring to himself or to a group. When I was unsure, I simply asked. There were also moments when our cultural sensitivities came to the surface. When I asked about the age of his wife, I found it difficult to obtain an answer. Through a common acquaintance I learned that Dr. Amporn wanted to know why I needed such personal information. Given he had revealed his years surviving in the markets of Surin, sometimes by stealing, his struggles fighting in the jungle as a boy soldier, and some of his doubts about his vows as a monk, I found the question regarding his wife’s age quite innocuous. It was a reminder that I am Canadian, and we are quite direct at times. What sort of feedback were you give by Dr. Amporn? He read each of the various drafts of the manuscript, and he gave me great feedback. He would question my use of certain words to ensure that they made sense. He often provided guidance where he felt that some descriptions or dialogue did not accurately capture the essence of what he had told me. Aside from his corrections, he often provided enthusiastic encouragement. For example, after rewriting the final chapter, following an additional round of interviews, he emailed me the following:“I have read your revised chapter 26 with great interest and surprise. You have totally grabbed all my heart.” It was rewarding to know I had expressed his emotions well. Then again, Dr. Amporn has often expressed his excitement that his story has been fully written, and his hope that it will inspire others. He has said more than once that the writing captures the very essence of his experiences. Is your book primarily written for a Western readership? What do you hope readers in the West take from it? The Boy with a Bamboo Heart was mainly written for English-speaking readers. However, the story has universal themes of strength, courage and the determination of one man to overcome tremendous obstacles to find his true calling, and to help others in need. Both Dr. Amporn and I hope that this book will inspire people everywhere to rise above the challenges they face in their lives to take responsibility for themselves and be active contributors to society. Is a Thai translation on the cards? Excluding Thai, to what extent has Dr. Amporn’s hope for translations been realised? The book has been translated into French and is currently being edited. We have not yet discussed other translations. What do you hope readers in Thailand take from The Boy with a Bamboo Heart? I hope that tourists will see another face of Thailand, and travellers will come to this country with a more open mind. My wish is that The Boy with a Bamboo Heart contributes to empowering people to take charge of their lives, regardless of the difficulties they face, and to become actively engaged in the causes in which they believe. The world has much need for everyday heroes. Dr. Amporn did not set out to be a hero, but he became one by the choices he made in wrenching situations and because he cared for something greater than himself. That is within reach for everybody. Let Dr. Amporn’s story serve as inspiration. What did you personally take from, or learn from, writing this book? The world faces many crises today. All too often we feel powerless to act or overwhelmed by our personal situations and too exhausted to look beyond the borders of our own lives. The courage and determination demonstrated by Dr. Amporn throughout his life was a powerful reminder that all of us possess within our reach the possibility to make a difference. What message do you think Dr. Amporn is trying to convey to readers everywhere, through this book? I owe a tremendous debt to Dr. Amporn for the privilege of writing about his life. He entrusted me with the joys of his life, but also with some very painful memories. His willingness to bare his soul and share his darkest secrets so that they could be publically retold required a new act of courage at a point in his life when he has already accomplished so much. I have deep admiration for his conviction that he must help others in every way so that no one has to live with the indignity of poverty and ignorance. As a tribute to his work, I am very happy to donate my author proceeds to FORDEC. Details: The Boy with A Bamboo Heart will be published on November 1, by Maverick House, in eBook and paperback, priced in local currencies.